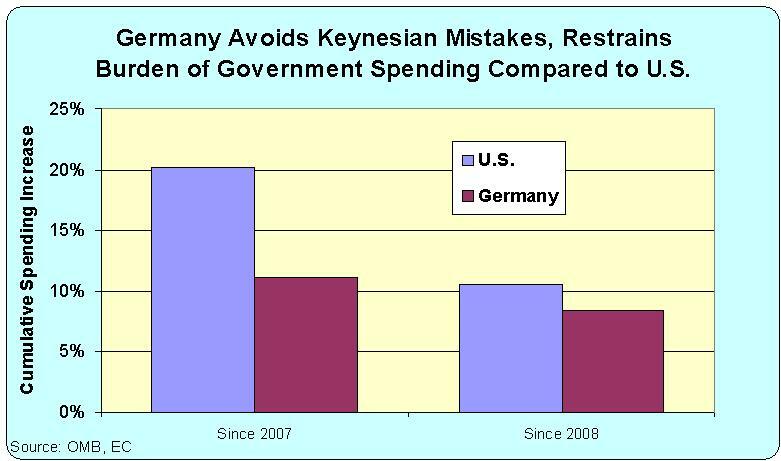 Last week in New York City, during my Intelligence Squared debate about stimulus, I pointed out that Germany is doing better than the United States and explained that they largely avoided any Bush/Obama Keynesian spending binges. One of my opponents disagreed and asserted that I was wrong. Germany, this person argued, was dong better because it was more Keynesian thanks to “automatic stabilizers” that resulted in big spending increases. This claim was made with such certainty that I wondered if I made a mistake. Well, we were both right about Germany doing better. In the past few years, it has been enjoying yearly growth of about 3.5 percent while growth in the United States has remained below 3 percent. But who was right about the key issue of whether Germany has been more Keynesian? At first, I was going to be lazy and not bother combing the data. But then I got motivated after reading an excellent post about Germany’s pro-growth reforms, written for National Review by Veronique de Rugy of the Mercatus Center. So I looked up the data on annual government spending in the United States and Germany and discovered that I was right (gee, what a shock). As the chart shows, the burden of government spending has increased faster in the United States. And that is true whether 2007 or 2008 is used as the base year. To make sure the comparison was fair, I sliced the numbers every possible way. But the results were the same, regardless of whether state and local government spending was included, whether TARP spending was included, which base year was selected, or whether I used annual spending increases or multi-year spending increases. In every single case, the burden of government spending grew faster in the United States from 2007 to 2011. This does not mean Germany is a role model. Government spending in Germany is far too high and it continues to grow. All we can say is that Germany is not going in the wrong direction as fast as the United States. Oh, I suppose we also can say that I was right and my opponent was wrong. The United States has been more Keynesian than Germany. Speaking of Germany, I combed my archives and found only one post that said anything nice about German politicians. My other German posts mocked the country’s scheme to tax prostitutes, mocked the government for losing the blueprints for its new spy headquarters, mocked the government for a money-losing scheme to tax coffee, and even mocked the supposedly conservative Chancellor for wanting to impose new taxes. So even though Veronique is correct about some positive changes, the Germans have a long way to go. Dan, you say: “One of my opponents disagreed and asserted that I was wrong. Germany, this person argued, was [doing] better because it was more Keynesian”. Naming and shaming such people who offer deliberate fabrications to promote an egregious government-increasing, anti constitutional agenda is one way to help them realize that telling the truth is crucial. So who was this individual and where do they work? You’re down on taxing hookers, while we are taxing tanning salons? And not hair weave parlors?